Harvard President Drew Faust meets with President Xi Jinping of the People’s Republic of China inside the Great Hall of the People, in Beijing. President Faust and President Xi “discussed a number of issues of mutual importance for China and Harvard,” according to a University announcement. 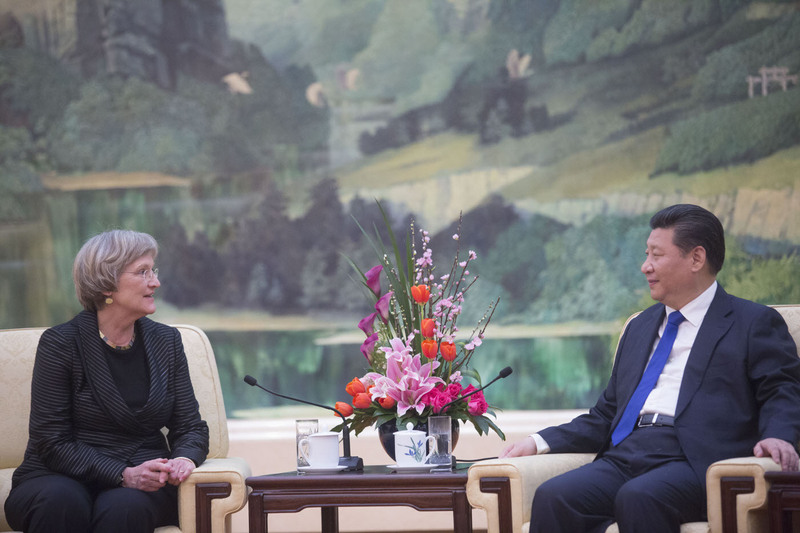 Harvard President Drew Faust met Monday evening in Beijing with Chinese President Xi Jinping. The two leaders discussed a number of issues of mutual importance for China and Harvard, including efforts to combat the threat of climate change and continuing collaborations among faculty and scholars. 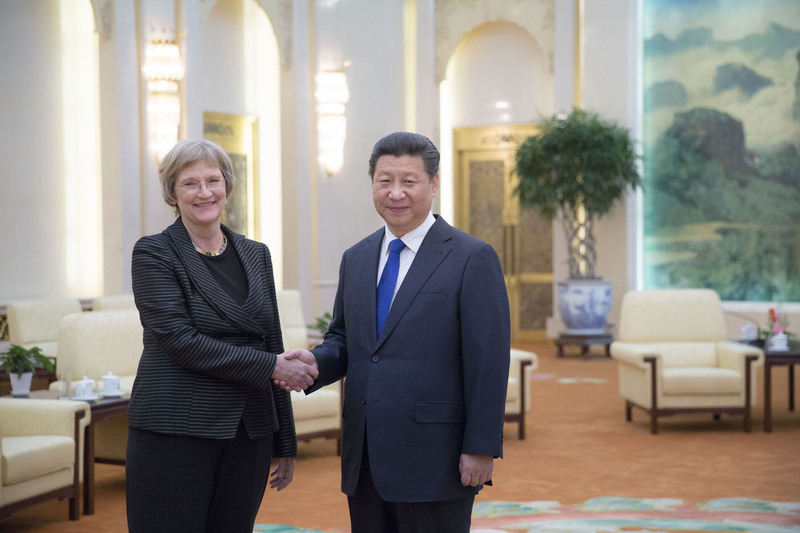 President Faust also invited President Xi to visit Harvard during one of his future visits to the United States. President Faust, who is scheduled to give an address on the role of universities in addressing climate change at Tsinghua University on Tuesday morning, highlighted the important work being undertaken by faculty and students at Harvard and at institutions across the globe to develop substantive technological and policy solutions to this global challenge. Last year, President Xi signed an historic climate change agreement with United States President Barack Obama. "I was very pleased by the opportunity to meet with President Xi to discuss several global challenges of mutual concern and interest to both the Chinese government, under his leadership, and to Harvard University, through the research and teaching of our faculty and students," President Faust said. "Addressing climate change, educating the next generation of leaders and supporting faculty research across disciplines into a host of problems facing China and the world are issues of deep mutual interest. They are also areas in which Harvard's faculty and students can fruitfully collaborate with scholars and policy makers in China over the coming years." Addressing climate change is of mutual interest to China and the United States, the first- and second-ranking emitters of greenhouse gases; President Barack Obama signed an agreement with President Xi last year, with each leader pledging to limit the nations’ emissions during the next two decades. Their agreement was seen as a step toward encouraging action at the international conference on climate change scheduled to take place in Paris this coming December. Harvard researchers and their counterparts at Tsinghua have long cooperated on analyzing problems associated with air pollution in the People’s Republic, and on climate change more generally. The Harvard China Fund made one of its first grants, in 2007, to the School of Engineering and Applied Sciences’ Michael B. McElroy, Butler professor of environmental studies, and Chris Nielsen, executive director of the Harvard China Project, to further their collaboration with Tsinghua to pursue public-health and economic studies of Chinese air-pollution-control policies. Nielsen and colleagues participated in a roundtable discussion of these issues at Tsinghua the following March, during President Faust’s 2008 visit to China. “Greening China,” by Mun S. Ho and Dale Jorgenson, presented some of the China Project’s research on these issues to Harvard Magazine readers in September-October 2008, and Jorgenson discussed climate change and international policy options directly in a more recent feature in the magazine. Read about President Faust's climate-change address at Tsinghua University on Tuesday, March 17.